“See the Forest for the Trees“. The older I get the more I appreciate straightness is a BIG deal to a horse. The issue is, we all get so bogged down by the details of riding, we forget that straightness is really a very important goal and very often the answer to most problems. I went on a massive search for explanations of straightness. I have tried to explain straightness to clients & realize I am just not conveying the importance enough…… I just can’t emphasize enough, How important straightness is to a horse. With Impulsion & Harmony……. So, we all know we are aiming for harmony, but do we realize straightness is the key? And further, how do we get it? 1. 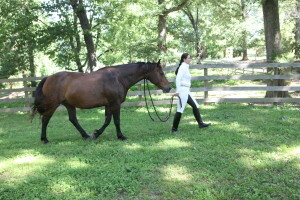 Your horse’s hind foot should track into or directly in front of the hoof print of the front foot. If you see the horse steps to the side of it, they are not straight. Most often you see this if they are over bent on their hollow side so they either pop out their shoulder or they are bent out and swing their hind end in. 2. Blowing out with the nose– in order for your horse to truly go straight, he must let his rib cage loose. For some horses, this is an especially big deal. You will know when they let their rib cage loose when they blow loudly out of their nose like they are clearing their airway. They will do 1-3 blows at a time. If they do not do this, they haven’t let their rib cage loose. If you have ever done yoga, this is the equivalent to taking deep breaths in a stretch. If you do it correctly, your whole body will let loose. The same goes for the horse. Once they take these deep breaths, their rib cage opens up and you will start to see their movement change. You must allow your horse to stretch down in order for this to happen. This is a quote from my mentor, Ed Rothkranz. I very often see horses get crooked as an escape from pulling hands especially at the wrong moments. Horses find straightness, balance & relaxation from the GIVE not a pull. The biggest area I see crookedness due to ill-timed hands is in a bend or corner. The half halt should be before and after the moment of perceived crookedness. The give should be through the turn or bend. You will know if you are doing this incorrectly if your horse bulges his shoulder in the bend or swings his body like a 2×4 in water. 4. Ride in a rectangle – Buck Brannaman has a great visual for straightness. He says imagine you are riding in a rectangle. If anything is bulging toward the edge, you need to straighten it out. 5. Get control of Each Foot– Ed used to tell a story about being a young man & not being able to get a horse to do as he wished. He had ridden the horse for an hour, got so frustrated he jumped off, kicked the horse and smoked a cigarette. An old military man was watching him and said, “Boy, give the horse to me for a moment”. He said the military man got on the horse, and never went out of a 4ft x 4ft square. He simply moved the hind end in each direction, the front end in each direction. Backed two steps, forward two steps etc for about 10 minutes. The man jumped off, handed Ed his horse. Ed got back on & said the horse was like rubber. He never forgot the feeling that horse had and he learned a very valuable lesson that day. 6. Jump a Square Bail– This is an exercise I have seen Melanie Smith-Taylor use many times. If you really want to test the honesty of your straightness, try and jump a square bail with NO jump posts on either side. If you and your horse are accustomed to jumping something bigger, start with 1 bail to get it right, but as you get better go ahead and stack them to be 2 bails high. You will not be able to do it unless you two are in complete balance and straightness together. Love this Lauren!! Finally understand and can “feel” foot fall (#5) myself from one of Mark Rashid’s videos. Everything is so light now and getting straighter and straighter 🙂 I love #2 also; I didn’t realize that when horses blow they’re releasing their rib cage (I did know they were releasing adrenaline)….this makes so much sense.